I'm quite desperate. 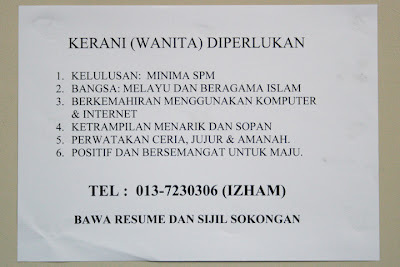 Need a clerk staying around Taman Universiti Skudai to help me on the office work. B. Mende aaa lu. Nak commission plak. Gua pun xde sen ni. Belanja McD boleyla.. Dah la gua call nak ajak lunch pun x angkat. Actually there was one girl called asking for the job. At that time, I was pooping in the toilet. Luckily the handphone was within my reach so that I can ask her to come over for an interview the next day. Before she came, she called again but at that time, I was again in the toilet and my poop were already half way out. The handphone were also out of reach. It was a private number so I guess it must be her. At around 11.20, there were 2 girls coming to the office and at first glance, one of them is cuter than the other one. The not so cute girl was the one who called for the interview.. CIS....! Anyway, she claimed to be fun, cheerful, and happy go lucky but I think my standard for being happy go lucky is way too high for her. I was a lil bit irritated when she sometimes gave me the look like I was flirting with her. Owh come on...! I think she's having problem with her self esteem, shy, timid and a lil bit smelly too. The smells may caused by walking around Taman U looking for job the whole day. End of the interview and I told her that I will call her later. Wednesday was a lil bit boring day. I started the day with seeing Mel and gave her the album of her pictures I shot at Punggai and Batu Layar near Desaru. Thank god, her friends were interested and they may lookup for my service later. Last time, Wednesday is the day I've been waiting for. It is the cheap movie day. I used to watch movies every wednesday with my ex-fiance last time. Almost every week. No single movie that I missed. Now in JB, I would normally asked Lin for the movies. Or else, I would just went to Jusco Tebrau and watch with myself. It's kinda pathetic sometimes for not being able to share the emotional intrigues from the movie. So my wednesday went off just like that. It was very frustrating when I get back to my car when I see this stupid note on my car. I've been parking my car for the last 2 weeks and no one has ever warned me about that parking space. That parking space is actually just a small area which cars can get in and park. I opted to park there as the local council issued a lot of summons to my car unconsiderately. 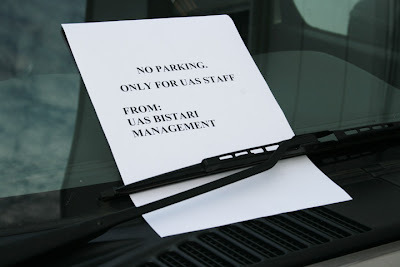 Sometimes, I left my car for 5 minutes to get the parking coupon but they already put the ticket on my windscreen. So parking at that small open area is free. Now somebody is being rough. It's okay. I'll just park my big car blocking the way in. Nobody can ever get in or out of that parking space after this. And tonight, it's very unsangkarable that my comment on ChikaDior's entry has been an intriguing comment that caused her to make an entry out of it..
"Orang selalu cakap, bila kecil comel, bila besar buruk tapi bila tua jadi comel balik.."
And of course it reversible when someone is ugly when small, became pretty or handsome after grown up and became ugly again when they get much older. I can't wait to see her growing old.